Need A Mortgage? Save Today! Mortgage down payment as low as 3%. We don’t sell your mortgage. Call and schedule an appointment to talk with a member of the Mortgage Team. They’ll meet you at the branch of your choice. *Maximum 97% Loan-to-Value (LTV). Must be owner-occupied; primary residence or second home only. Purchase, refinance from another institution, or Home Equity Line of Credit included. Minimum loan amount $50,000; maximum loan amount $1,000,000. APR = Annual Percentage Rate. Example: for a $100,000 loan for a term of 30 years with an interest rate of 4.50% (4.598% APR), the monthly payment will be $506.69. Sample payment includes principal and interest only; taxes and insurance will increase your payment. The rate you pay is based on credit history and term. Loans exceeding 80% of the appraised value of the home require private mortgage insurance. Programs, rates, terms, and conditions are subject to change without notice at any time. Savings account required for loan. Only a $5 minimum deposit required to open account and become a Launch FCU member. 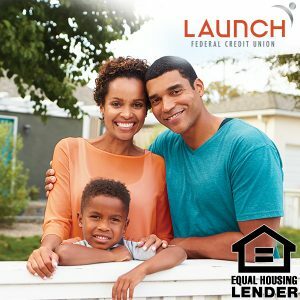 Submit this article when applying for a qualifying Launch FCU real estate loan and Launch FCU will waive the $400 processing fee; this offer is good April 1 – June 30, 2019. Cannot be combined with any other offer.